Nicholas Hellmuth reviews tripod heads, especially ball heads from Arca-Swiss, Gitzo, Manfrotto, and KIRK. How to learn about ball heads from Gitzo, Manfrotto, Arca-Swiss, and others. With over 40 years experience photographing out in the field as well as in photography studios in Japan, Europe, the US, and Latin America, we are expanding our coverage of reviews of tripod heads. Here are the Gitzo and Manfrotto heads that we have already reviewed in past years. We are now arranging to receive additional tripod heads to evaluate. A Manfrotto MH055M8-Q5 hybrid HDSLR video-still photography head arrived this month (January 2012). Three of the heads which we received over past years did not hold up. One broke after a few months (a tripod made in China). This is the head you may want to avoid. Two action grip tripod heads did well for two or three years (and I really liked them), but gradually their tightening system wore out and they could no longer be used. Sham-review sites never mention any digital camera product is bad, or wears out; sham-review sites (many of which are just content farms), simply want to send you to the camera dealers to collect a click-through commission. We receive no money, no commission, for the sale of any tripod or tripod head, so we can indicate clearly which heads wore out. The other heads are great. I especially like the two geared heads we have had for over fifteen years. These Manfrotto model 400 heads are great for holding a 4x5” or medium format camera in the studio. Since new tripods come out every year, we are thus expanding our evaluations into 2012. 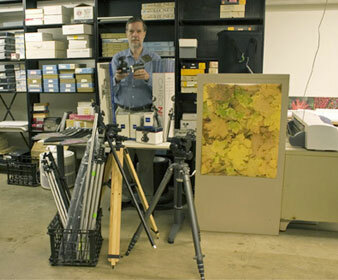 Here is Nicholas Hellmuth evaluating the ball tripod heads Gitzo. Our experience is that most tripod heads need to be retrofitted after three to five years. They still function, but they sag, and you have to keep tightening them. Whether they can be sent in for refurbishing I don’t know, since we do most of our photography in Guatemala the cost to send a tripod head back and forth for repair is not realistic. My original Arca Swiss monoball head still works after more than 30 years, but I will admit it does need to be sent in for refurbishing. However my Gitzo tripods hold up for over a decade (these are the ones made since Bogen took over (now Manfrotton Distribution). Old Gitzo heads, about 40 years ago, distributed in USA by a person with Germanic name, did not hold up as well. 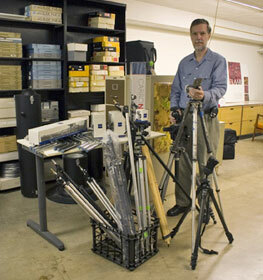 But the Gitzo tripods that I have for evaluation, if they have the click-step leg-top gizmos, these are wonderful. Tripods with one long clasp (about 4 inches long) these don’t hold up as well since students and new assistants don’t realize you have to lift up the clasp every time you move a leg into any position. So the students and assistants wear out the clamp system every time. But the legs with the click-stop (with steps), you simply open them up and use the tripod all day long, moving the legs into any position, and nothing wears out (for decades!). I use a ball head every day that I am photographing with my Canon, Nikon, or Hasselblad cameras. But I would prefer never to use a ball head with a 4x5” large format camera. The best tripod head for any large-format camera would be the geared head from Manfrotto. When I bought this it was named the Manfrotto model 3263. I liked this so much I got a second one (since often I am using two cameras simultaneously side-by-side or at least in the same studio). Notice that I have two of the same large geared heads. I never bought the medium geared head or the small geared head. Why? Because the Manfrotto 400 and Manfrotto 3263 have handles to allow you to easy crank the three controls. Plus, the larger handles easily fold-up perfectly so you can travel with this tripod head without worrying about the handle cranks wearing out. The two smaller models, Manfrotto 410 Junior Geared Head and Manfrotto 405 Pro Geared Head have no cranks on the handles. Once you get accustomed to the handy handles on the larger models, I find the smaller models awkward to move. Whether you want to put a head under the pano head is entirely your choice. You can place the pano head directly onto your tripod if you wish. The Pano head I have the most experience with is that from NOVOFLEX, their Q mount system. It really helps now that Gitzo offers an Arca-Swiss Quick Release plate adapter, item #:GS5160CDT. The Arca-Swiss plate size and shape is an international standard, used by KIRK and many other companies. My first 40+ years of photography were in architectural history, archaeology, and artifacts. So I did not need a gimbal head. Today I have been photographing plants and animals, so I am realizing that I need to evaluate gimbal heads, especially for photographing birds. Nicholas photographing birds with a Canon Mark III Canon EF 100-400mm f/4.5-5.6 L IS USM telephoto zoom lens, Río Chiquimulilla, Monterrico Guatemala 2010. 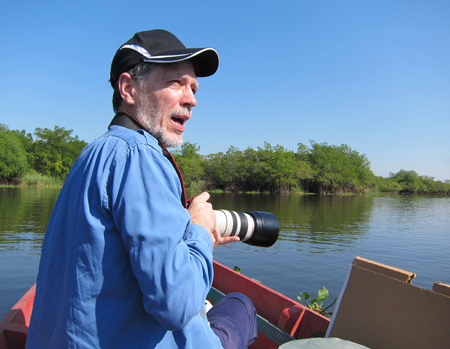 Of course sometimes there is no way to safely use a tripod, such as when you are in a small boat on a crocodile-infested river in tropical Guatemala, Central America. If you try to stand up with a tripod, and the boat has to dodge a crocodile or caiman by moving quickly to the right or left, or if the boat hits a hidden submerged log or rock, you (and your tripod and your $10K lens and $8K Canon EOS-1Ds Mark III camera will be thrown into the river). We look forward to receiving, and testing, gimbal heads later in 2012. What tripod heads will FLAAR utilize in 2012 onward? I definitely realize a need for the Gitzo Systematic Ball Head with Hydraulic Lock, item #: GH5380S. Since we now have more telephoto lenses for our Canon EOS-1Ds Mark III camera, I can see a need for a gimbal system. The question is whether to go with a Wimberley WH-200 Wimberley Head Version II, or a Manfrotto 393 or a King Cobra from KIRK. I have never found rectangular L-shaped brackets to be stable enough with pano heads, so the full U-shaped Manfrotto system looks like the best solution. I would be tempted by an Acratech (Ultimate Ballhead), Burzynski (Ball Head II) or Markins M20 ball tripod heads, but since I never see these companies at PhotoPlus in New York, kind of hard to speak with them about getting one for evaluation. So a Kirk, NOVOFLEX, Gitzo, or Manfrotto ball head is the next ball head that we will consider to evaluate. Most recently updated January 27, 2012. First posted July 21, 2006. Updated November 2011.